Image via Wikipedia...at least that's what my spirit guides told me. I had my annual New Year's reading from my favorite psychic, Katherine Glass. I won't share all the intimate details, but I will share some valuable advice from my spirit guides that I think applies to everyone. First of all, Katherine confirmed that two of my spirit guides are my mother and my sister, both of whom passed many years ago. Katherine says that they both continue to grow and evolve on the other side and that my mom is "way evolved over there." I know for sure that my mom was with me in the ER when I was diagnosed with bi-lateral lung embolisms. I could feel her presence hovering over me, watching out for me. Maybe she even led me to call my nephew who finally diagnosed me and possibly saved my life! My maternal grandmother showed up, too, to send me love and support. So, here is some valuable advise that is both personal and universal. My spirit guides told me to HAVE HOPE. I'm at the end of an era of health issues. It is onward and upward from here. Over the next three years I should continue to heal physically, psychologically and spiritually. I need to let go of expectations and line up a support system of good friends who will be there for me like sisters. My mom told me to be patient. I am progressing, evolving and growing. Mom said, "Be patient, Honey." Stop focusing on others and what I'm not getting and focus on myself and what I can get. I can't change anyone else, but I can change myself. My guides told me to live without trepidation and without focusing on the hardships. Turn a new leaf - have faith and believe; get playful, joyful. Do something creative and fun, like singing lessons, and do it without judgement or criticizing myself. Love and support myself. Stop struggling - relax and let go. Find peace in my conflicting mind. Know that my guides hold me, love me, and keep me safe, even in death. It is a huge relief to pass over, but it's not my time yet. My guides told me that I have an innate wisdom. I know what to do and I should profoundly trust that. They said shine and everyone sees it. Be authentic - align with my true self and not my traumatized self (which is my New Year's resolution and wish for 2012). Align with your name and who you are. My mom named me Joy because joy is who I am. Open my consciousness and feel the bigness inside me. That's when the co-incidences, opportunities, happiness and smoothness happens. Connect to the Universe in love and gratitude, even in the grief. LOVE IS THE NATURE OF THE UNIVERSE. Use love as my motivation in everything - choose love over fear. I should ask my guides for guidance as they can help me greatly. My crown chakra is opening so that I am better able to receive guidance from the spirit world. My power chakra (belly) and my throat chakra are healing, clearing and getting more open. But I still have more to "say" in this lifetime and I need to speak my truth. Katherine said that singing creates vibrational healing throughout the body. But I need to sing with confidence. If I hold back, the notes won't come out right. She said, "There is incredible confidence to have your voice heard." 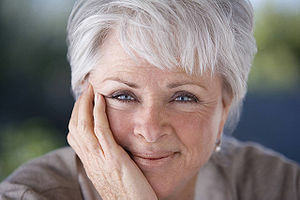 Katherine suggested that I check out The Work of Byron Katie to help me with "the turn around" of fearful, depressing thoughts and return my mind to it's true peaceful and creative nature. She also suggested nourishing my pysical body with acupuncture, Chinese herbs and a tonic for continued lung support to get the physical foundation strong in support of the spiritual body. 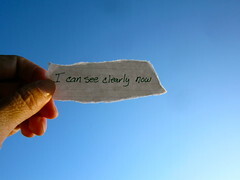 Image by katerha via Flickr...is my theme song for 2012. On Monday I was driving to my health club (just like in my dream) with my daughter when "I Can See Clearly Now" came on the radio. I told my daughter that I love this song and started to sing along. But as I really listened to the words, I started to cry. After finally coming through my "lost" year, the lyrics were speaking right to my heart: I think I can make it now, the pain is gone; All of the bad feelings have disappeared; Here is the rainbow I’ve been prayin' for... Then on Tuesday I was at my health club again waiting for my water aerobics class to start and the first song on the instructor's work-out mix was - you guessed it - I Can See Clearly Now! Of course, I sang along again, but this time I didn't cry, I just smiled. The instructor never uses the same music twice, so this song was a direct message from the Universe to me.